A bathroom is a room for personal hygiene activities, generally containing at minimum a toilet and sink. 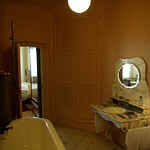 A bathroom may also contain a mirror, a bathtub or a shower, and possibly also a bidet. 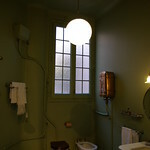 In North America and some other regions, it characteristically contains at least a toilet and a sink; hence in North American English the word "bathroom" is commonly used to mean any room containing a toilet, even a public toilet (although in the United States this is more commonly called a restroom). 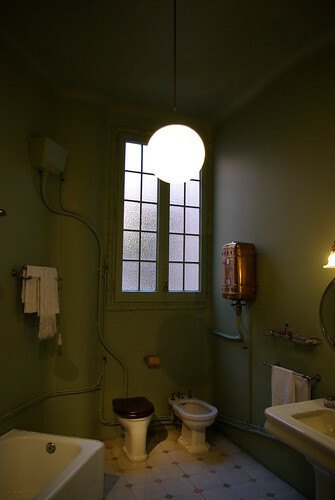 In other countries, including the UK, Australia, France and Japan, homes may have a separate toilet room. In Iran almost all homes have two distinct rooms for the bathroom and the toilet room. Bathrooms often have one or more towel bars or towel rings for hanging towels. Some bathrooms contain a medicine cabinet for personal hygiene products and medicines and drawers or shelves for storing towels and other items. All forms of bathroom lighting should be IP44 rated as safe to use in the bathroom.